There are no charges for consumer debit cards such as Visa Debit, Mastercard Debit and Maestro. From 13 January 2018, the EU’s Payment Services Directive (PSD2) prevents retailers from passing on card charges to consumers. We never profit from exchange rates, so unlike our competitors we cannot hide card charges in our exchange rates. With Mastercard and Visa charges of 0.9% on credit cards and charges of 1.8% on Amex, it is no longer economic for us to accept those cards. We continue to accept corporate credit and debit cards as these are outside the scope of PSD2 and are charged (at cost) at 1.833%. This is clearly itemised in the checkout. 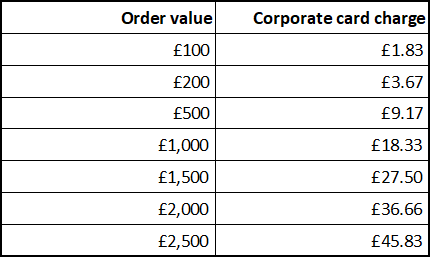 The handy table below indicates the cost of using a corporate card. Some card issuers may also apply an additional cash advance fee for purchasing foreign currency - please check your terms and conditions before you buy. These fees are not included in our charges.